The English composer Howard Blake is a living legend with soundtracks like "With Umbrella, Charm and Bowler" or the Academy Award nominated "The Snowman". That such a musician invites someone to make music is probably quite unlikely. That he then also places a new work on the music stand for a premiere recording is almost a miracle. 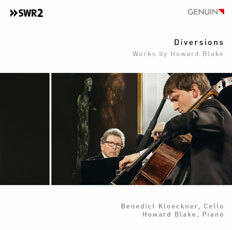 Benedict Kloeckner proves that he is worthy of such an honor: the rising star of the cello scene literally merges together with the grand master himself at the piano to become one on this new GENUIN CD: the whole variety of Blake’s oeuvre, his rhythmic finesse and his humor lights up in thousands of colors. A must for chamber music and film music fans! "Howard Blake himself handles the piano part with dramatic credibility. (...) Kloeckner responds with an extraordinarily vibrant tone and rhapsodic lucidity. (...) It is not high modernist but it is thoroughly contemporary. It has a special quality to it that belongs very much to the musical personality of Howard Blake. Very much recommended." "Blake and his cellist friend Kloeckner make a fine pair in this program. The music is not easy to play, and there are demands made and carried out with aplomb." "The recording is well judged and the booklet is sympathetic, quoting from a variety of source material."